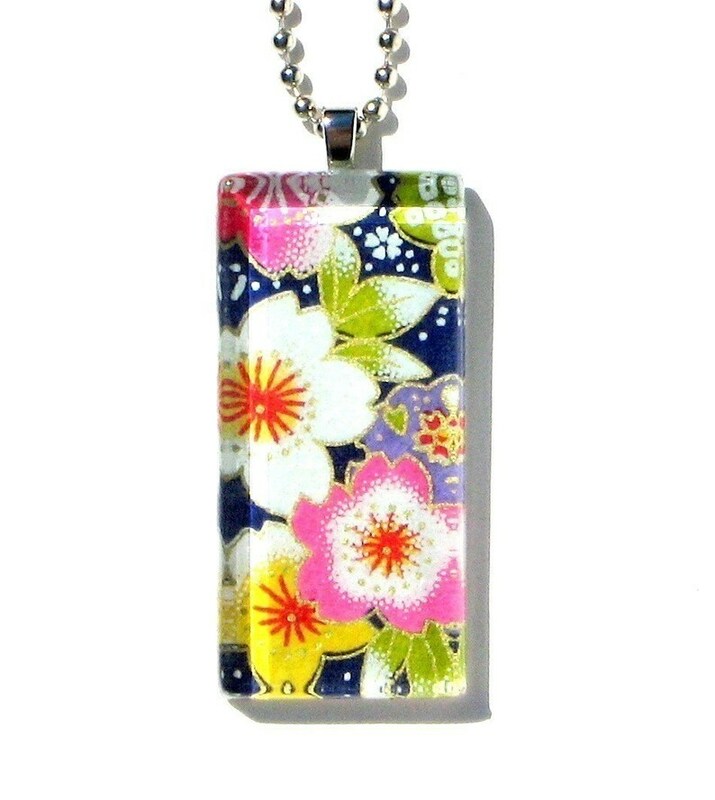 This updated and very feminine dogtag style pendant is perfect with a simple blouse or tee. This season, long chains are in and this one appropriately dangles from a 24" silver plated ball chain. Japanese chiyogami (old-paper) features multiple, brilliantly colored plum flowers against a midnight background. The thick 1/4", handcut glass gives off amazing depth and reflection to the age old paper. Necklace comes beautifully packaged in a coordinating gift tin. Makes for a fabulously quick and easy gift.Just add a card and you're done! ALSO AVAILABLE IN MY SHOP: CABLE CHOKERS IN 16" AND 18" SHIP FREE WITH YOUR PENDANT PURCHASE!